All of the encoding work is done inside the StreamEez-Pro device. To manage your video stream, the StreamEez-Pro application is included and runs on Windows 10, 8 or 7. To install, plug the StreamEez-Pro device into a USB 2.0 or 3.0 port on your Windows PC, and install the StreamEez-Pro application. The StreamEez-Pro application will manage your connection to the Internet streaming service you will use. StreamEez-Pro also supports ‘Works with Wowza’ for one click setup of your Wowza stream. The StreamEez-Pro application can manage up to 4 StreamEez encoders. This allows you to support multiple CDNs, multiple bit rates, or even multiple video sources. The StreamEez video encoder is a rugged, high quality real-time HD encoder which converts HDMI video into H.264, the most widely used format for streaming video over the Internet. 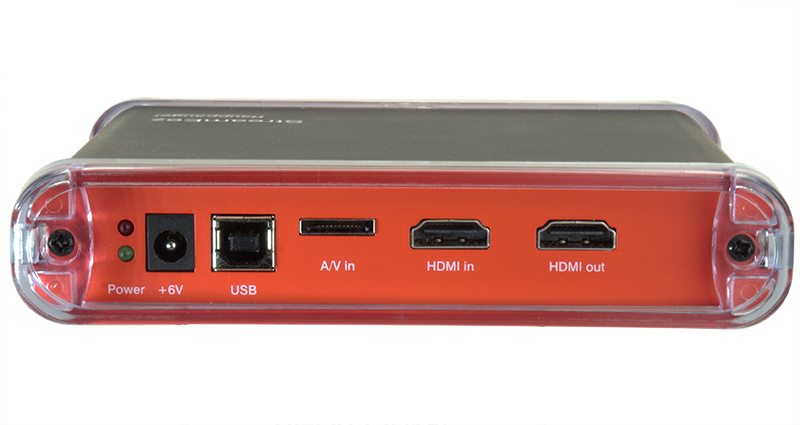 The StreamEez video encoder accepts HDMI video at up to 1080p60 and has a down scaler which can convert video to a lower resolution format such as 720p "on the fly". The StreamEez encoder also includes a logo inserter which can take a transparent PNG file and overlay it on top of the live video. There is an HDMI output port which can be used to connect to a video monitor. 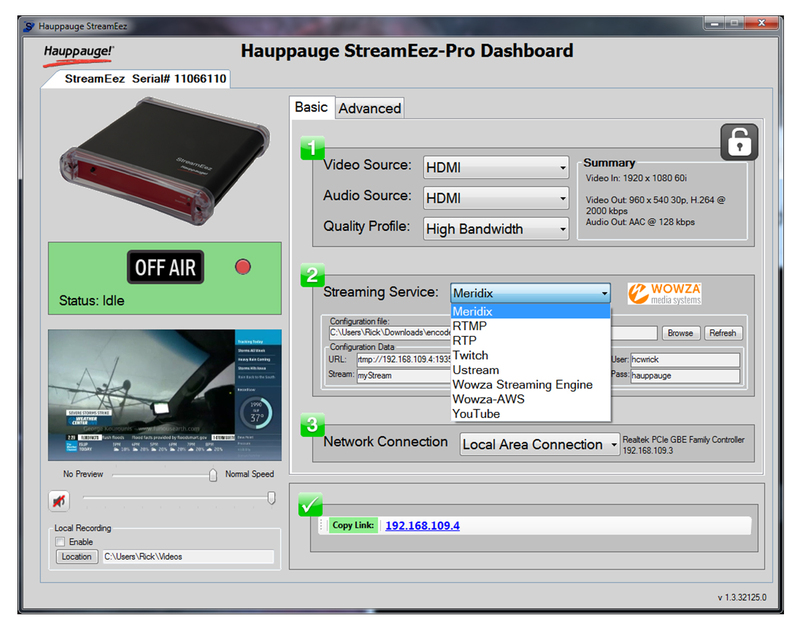 The Streameez-Pro application runs on Windows 10, 8 or 7 and has a simple to setup access for Internet video streaming to Amazon Web Services through Wowza, plus supports the Meridix sports streaming service, Twitch and YouTube. 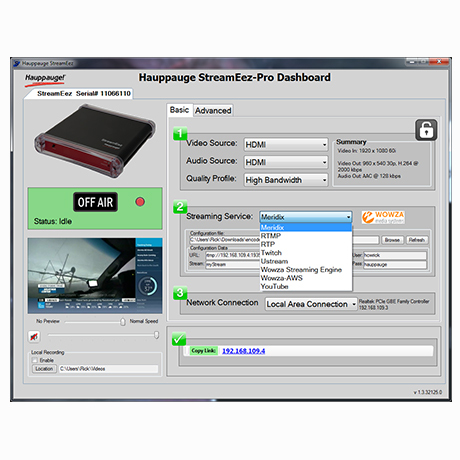 The StreamEez-Pro application allows a user to easily choose streaming profiles for low, medium and high bandwidth services. For advanced users, StreamEez-pro allows the creation of custom profiles with settings for bit rate and scaling factors. In addition to the built-in streaming services, StreamEez-Pro can support other streaming services using RTP or RTMP protocols. Because all of the video encoding is done inside the StreamEez device, you can use any speed Windows PC, even a small netbook, though for best resulls we recommend an i3 or faster. To stream a live event using StreamEez-Pro, an organization would need to have the StreamEez-Pro video encoder, a high definition HDMI camera, a laptop computer and an Internet connection. In addition, an Amazon Web Services account or an account with Meridix, Twitch or YouTube Video can be used. Examples of live events which StreamEez-Pro can be used for are church events, school board meetings or other town hall events, and sporting events through the Meridix Sports Network. The StreamEez-Pro HD encoder contains a built-in logo inserter which combines your logo to your video stream inside the StreamEez-Pro box. You can add a transparent PNG file, with up to 120,000 pixels in any aspect ratio with up to 256 levels of transparency, to your video streams. The StreamEez-Pro application can manage up to four StreamEez devices at one time. Stream multiple camera angles or use multiple video services. StreamEez-Pro manages each stream or service independantly. The StreamEez-Pro management application has a new Wowza Streaming Engine profile. Use the Wowza quick configuration mechanism introduced in Wowza Streaming Engine to easily setup your streaming event! StreamEez-Pro supports Wowza Server (V3) and Wowza Streaming Engine (V4) running on any server. The StreamEez-Pro management application now has a Wowza Streaming Engine profile for the new Wowza quick configuration mechanism introduced in Wowza Streaming Engine. Plus the StreamEez-Pro RTMP profile supports connection to any Wowza version. Additionally, StreamEez contains a custom Amazon Web Services (AWS) management console which provides a seamless environment if you choose to host your Wowza server on AWS. RTP Broadcast allows you to 'broadcast' a video stream over a local area network. This can be over a office network or a college campus. RTP streaming minimizes network bandwidth by sending only one stream to many people. So, even if you are broadcasting a 5 Mbit/sec video stream to 100 people, you only need 5 Mbits/sec from your network. If you used a video server, 100 people watching a 5 Mbit/sec stream would consume 500 Mbits/sec on your network! If you only need to stream one video or maybe a few video channels over your company or school network, RTP streaming may be for you. A popular way to use RTP Broadcast streaming is to connect a video source (HDMI video camera, cable or satellite box using Component video, etc.) to the StreamEez-Pro and then stream this video over your network. 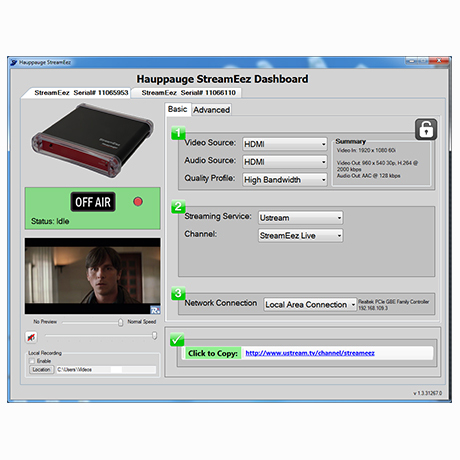 You will need one StreamEez-Pro for each of your video streams (each StreamEez-Pro can send out one video stream). But you can put mulitple StreamEez-Pro's on your network. To setup RTP Broadcast streaming, you connect a StreamEez-Pro to your Windows PC, then install the StreamEez-Pro application on the PC (this becomes the RTP Broadcast server). Connect that PC to your local area network. Then, on any device on the network, you open a video player (our example uses VLC but other network video players will work as well) and 'point' the URL of the player to the StreamEez-Pro. You'll then be watching live video from your StreamEez-Pro in the video player. How to setup RTP streaming with StreamEez-Pro. Note: StreamEez will not encode video from HDMI with HDCP copy protection. When you use StreamEez-Pro to stream live events with YouTube or Twitch, you can simply copy the URL from StreamEez-Pro and either e-mail this URL to your viewers or embed this URL on your webpage (maybe with a note:"Click here to watch our live event"). If you're using Wowza on Amazon Web Services (AWS), you need to embed a video player in your website with a link to the AWS stream. Look below for instructions on this. If you have an Amazon Web Services account and are using Amazon AWS to stream your live events, StreamEez-Pro can automatically create HTML code which you can add to your website so your users can watch your live event streamed with StreamEez. One way to do this is to embed the JWPlayer, a popular video streaming player, in your website. The following procedure will allow people on Apple devices (iPad, iPhone), Android devices plus PCs and Macs to watch your video stream. 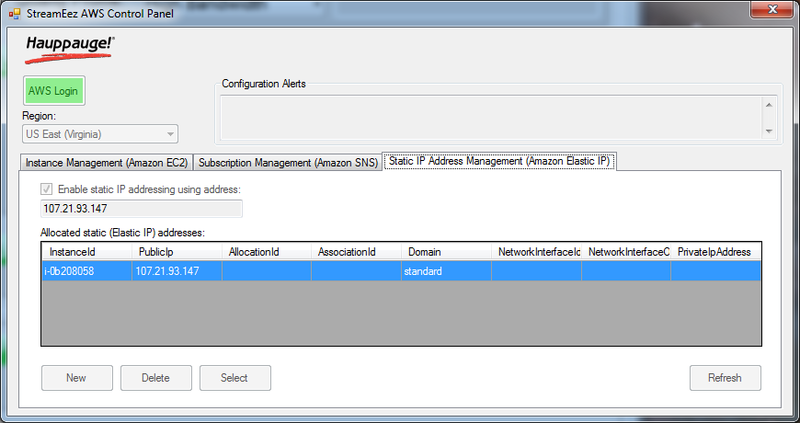 Note: we suggest you allocate and enable a static IP address in StreamEez-Pro. You can do this in the Amazon Web Services Management section in StreamEez-Pro. See the picture on the right entitled AWS static IP setting. In StreamEez-Pro, in the Streaming Service drop down menu, select Wowza-AWS. In Amazon Web Services Management , click Configure and enter your AWS credentials. Click close when finished. The Run button will be enabled. Click the Run button to start Wowza running on AWS. Wait until the Copy HTML button turns green. This takes about 3 minutes. When the Copy HTML button is green, click it. This will copy the HTML setup code to the Windows clip board. See below for an example of this HTML setup code. Paste this code into an empty HTML file. This HTML file will now contain JWPlayer with a built-in link to your video stream on Amazon Web Services. Save this HTML file into the directory on your website where you saved the three JWPlayer files.This HTML code has a link to JWPlayer and all of the Amazon setup information needed for your video stream. To put a link on your website to play your video stream, just link to this HTML file. A webpage will open with the JWplayer and your video stream. To watch your live Wowza AWS stream, copy the URL link from StreamEez-Pro and replace Localhost with the URL which you copied from StreamEez-Pro. Then click Connect. nanoStream Server and nanoStream Cloud from Nanocosmos are the perfect live video streaming products for campus and office building IP video distribution. The nanoStream server (or the nanoStream cloud service) provide high quality video and low latency playout for true interactive live streaming applications. nanoStream server delivers a max. 2 seconds end-to-end latency. Both the nanoStream server and the nanoStream cloud service come with a plug-in free HTML5 player for both mobile devices or PC's and Macs. 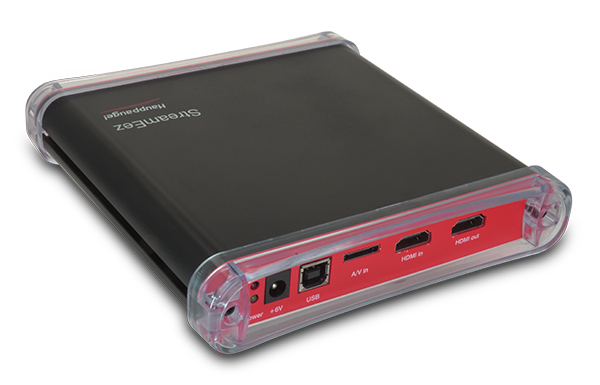 Use the StreamEez-Pro to provide HDMI video for use with the nanoStream server and cloud service. For on-premise installations in office buildings, college campuses, town-hall meetings, enterprise video communication or other use cases which require local servers. The nanoStream Server consist of an RTMP server and the H5Live server for low-latency HTML5 browser playback. Subscribe to our cloud service for your event based live streaming, webcasts, music, news, church events nanoStream Cloud is a super easy-to-use managed solution with instant live streaming. It includes the nanoStream RTMP and H5Live server products and the easy-to-use bintu.live dashboard and REST API for instant live streaming, grouping and tagging. 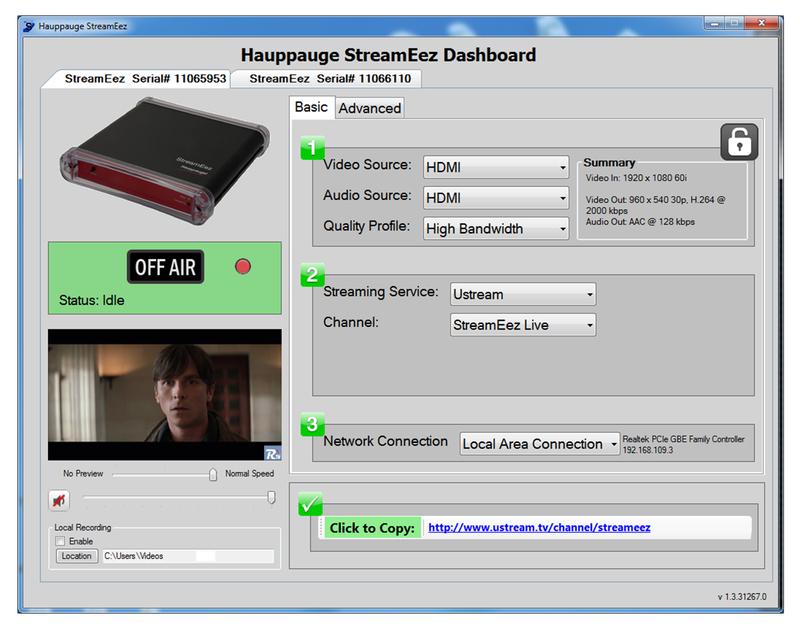 The combination of the Hauppauge StreamEez-Pro, high quality hardware encoder and the nanoStream Server or Cloud products enables you to have an end-to-end superb quality, low latency live video experience. nanoStream Server and Cloud both contain RTMP services and the unique nanoPlayer with H5Live Server for browser-based HTML5 live playback technology, plugin-free, high quality live video playback in low latency on all browsers including iOS10!